Welcome to another Cartridge showcase. The cartridge I’ve chosen to showcase is Mickey & Friends for the Thursday Cartridge Showcase with the CWC Design Team. This was one of the very first cartridges I bought. When you think of Mickey & Friends, your first thought is Mickey, Minnie, Donald, Pluto…..I thought I’d show you what else is on the cartridge other than the obvious. 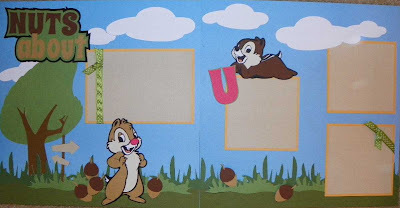 The first layout features Chip & Dale and is titled “Nuts About U”. All the paper used is DCWV and the ribbon used is American Crafts premium ribbon. (Found and excellent sale at TJ Maxx, Marshall’s for those of you that don’t have TJ Maxx!). The clouds are double cut to add depth. 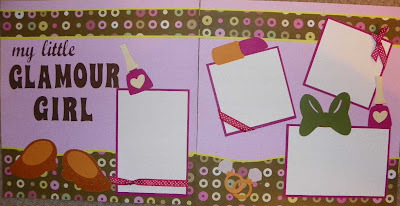 The second layout is “My Little Glamour Girl” for my glamour girl granddaughter Daria. She is always dolling herself up. Again I have used DCWV paper, including the glitter paper on the diamond rings, and American Crafts premium ribbon. 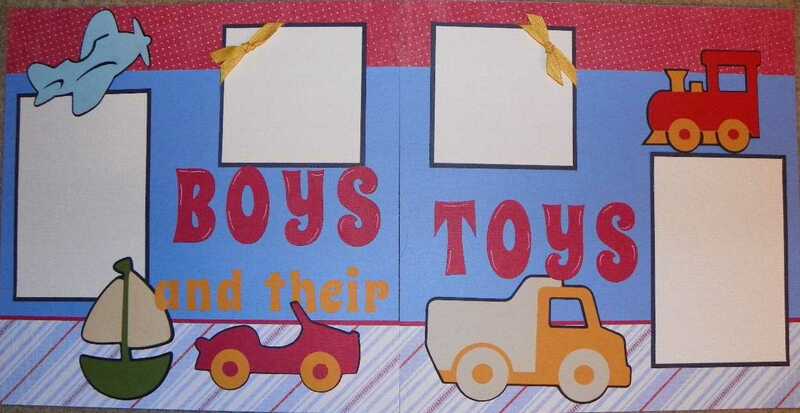 And last but not least, “Boys and their Toys” is for my nephew Griffin. He is so into trucks, cars, boats and trains. The paper is DCWV and the ribbon is American Crafts premium ribbon. I think I’ve shown how fun this cartridge is outside the obvious. All these wonderful hidden cuts. Wendy, thank you for such beautiful layout inspiration and all the amazing ideas! Your layouts are absolutely spectacular! What fantastic layouts Wendy! Thank you so much for all the superb creative, layout inspiration! You truly help us to think past the Mickey only mindset! Great showcase! great job!!! You can't even tell which cart you used on most of these.. I had to go back to the top and make sure I read Micky & Friends right lol. All your layouts are super cute! You have really inspired me to make some layouts. Thank you for sharing your talent and ideas with us. After seeing your layouts I am going to look at the images on my cartridges that are not the main images more:) Thank you. Great layouts- I love the titles and images you choose. Great job Wendy!!! Love all the projects! a layout like you did for a boy. So cute! Great job on the showcase.